WHILE Mallorca is a beautiful island full of sun and sand, those same luxuries, along with everyday life, can dirty and damage your fabrics and floorings. 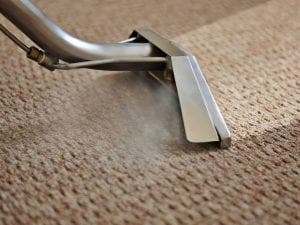 The island’s very own expat-owned floor and upholstery cleaners, Xtreme Clean, have been scrubbing stains out of natural stone floors, carpets and rugs and fabrics of all materials for over ten years. Ancient stone and antique rugs are a speciality of the highly qualified team, all of which are trained by both the UK’s National Carpet Cleaners Association and the Institute of Inspection, Cleaning, and Restoration Certificates. “It is quite the serious business, when working with strong chemicals and delicate surfaces,” owner Kenneth Couchman told The Olive Press. The team even brings their own door mats to the job, making sure they leave no trace behind. “It’s surprising how many people forget to clean their mattress, you don’t just wash the trousers and not the underpants,” Kenneth added, as many people forget that after six months a mattress can be very grubby inside.